Edward S. Curtis (1868-1952) was a driven, charismatic, obsessive artist, a pioneer photographer who set out in 1900 to document traditional Indian life. He rose from obscurity to become the most famous photographer of his time, created an enormous body of work -- 10,000 recordings, 40,000 photographs, and a full length ethnographic motion picture -- and died poor and forgotten. His work was rediscovered in the 1970s and is now synonymous with photography of Indians. Coming to Light tells the dramatic story of Curtis' life, his creation of his monumental work, and his changing views of the people he set out to document. The film also gives Indian people a voice in the discussion of Curtis' images. Hopi, Navajo, Eskimo, Blackfeet, Crow, Blood, Piegan, Suquamish, and Kwakiutl people who are descended from Curtis subjects or who are using his photographs for cultural preservation respond to the pictures, tell stories about the people in the photographs, and discuss the meaning of the images. "The 56-minute version contains all of the elements that are in the original 84-minute version, but many of the details and some entire scenes have been edited out. For example, Curtis' building a camera at the age of twelve and homesteading on Puget Sound at nineteen are cut. His first meeting with J.P. Morgan is condensed into a brief mention. The entire contemporary Suquamish tribe is cut, with just a mention of Curtis' first Indian "subject," Princess Angeline. Also omitted are Curtis' rescue of famous scientists on Mt. Rainier and subsequent journey as official photographer on the 1898 Harriman expedition to Alaska, his 1911 fundraising "Picture Musicale" tour and triumph at Carnegie Hall, and the discussion by Indian people of the government boarding school system and other policies of assimilation. While still visually stunning and rich in complexity, most scenes in the 56-minute version are shorter, with less detail, less analysis, less history, less of Curtis' personal life, less exploration of contemporary Indian cultures, less richness. "COMING TO LIGHT tells more than the story of its main subject, 'Edward S. Curtis and the North American Indians.' It tells, too, of the tragedy of cultural loss and hopes for recovery of memory. The film honors the great achievements of Curtis by placing his pictures in a vibrant frame of sorrow, desire, and promise. In its sensitive and intelligent fusion of image, sound, and story, the film offers an extraordinary experience of living history. It cannot be praised enough." "The Odyssean photographic career and poignantly forlorn private life of Edward S. Curtis are charted with impressive sensitivity in this very welcome portrait...It's an outstanding subject, one that...emerges compellingly in documentary form." "Beautifully filmed, skillfully edited and well-paced, Coming To Light is highly recommended for courses on North American Indians, visual anthropology, and American popular culture. Well researched and deftly touching on the complex politics of cross-cultural visual representation, Makepeace's film exhibits a balanced perspective on Curtis as a trailblazer in visual ethnography." "An unusually well-balanced view of Edward Curtis' life and works as the best known photographer of North American Indian people during the first part of the twentieth century." "Remarkable, a fascinating and thorough look at a photographer whose 40,000 images recorded Native American life." A stunning portrait of land-use conflicts over Native American sacred sites on public and private land around the West. "A phenomenal film. Well crafted, intelligent, and beautiful to behold...brings historical depth and cultural context to our understanding of Curtis' photographs and his monographs on Native Americans...I highly recommend this piece for use in Art History courses, Photography courses, Native American Studies, and especially in Anthropology." 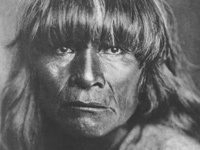 "Anne Makepeace has done total justice to the myth and the man that Edward S. Curtis was. Coming to Light is a thoroughly researched masterpiece of its own, honoring the man whose portraits continue to honor the beauty and glory of American Indians." "This superlative movie will serve the classroom well, for its historical value as well as the many issues it raises: the nature of culture, cultural representation and revitalization; Native perspectives, and the ongoing relationship between Indians and non-Indian"